Why do wines have corks? And, are screw cap wines inferior to wines with corks? In today’s video Annabelle McVine discusses screw top wine and wine cork to answer this viewer question. The humble wine screw cap has been the cause of much debate over the years. And everyone loves a wine bottle with cork. But, are there any downsides to wine cork? And what are wine corks made of? WineScribble explores the wine cork tree. A viewer sent me a direct message on Instagram the other day, asking: Is it safe to assume that screw cap wines are inferior to wines with corks? That is such a great question! Thanks so much for asking, Peter. I really enjoyed gathering some data on this topic and can’t wait to share with you everything I have found out! 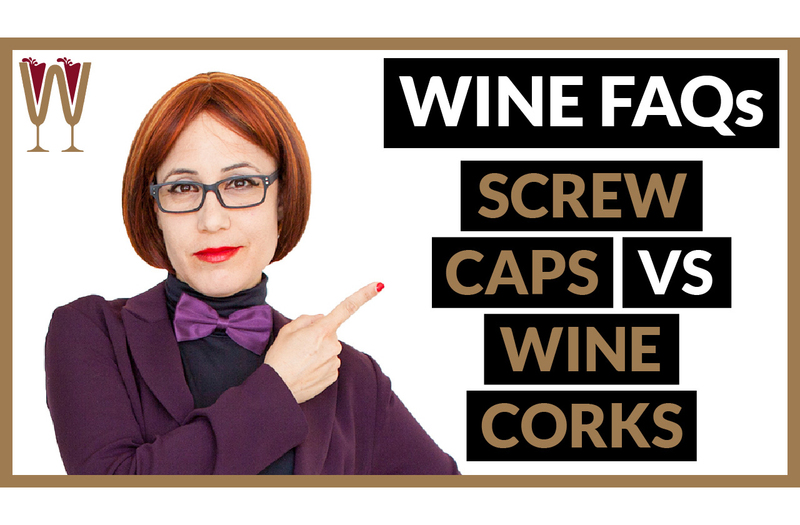 Stick around for some fascinating facts about wine screw caps and wine corks! As well as some bonus cork trivia. Cork comes from one particular type of tree known, unsurprisingly, as cork oak. And cork is pretty amazing. It consists of water-resistant cells and it is impermeable to both gas and liquid, resistant to rot, termites and fire as well as being lightweight, soft and buoyant. No wonder it is ideal for stopping wines! So why bother with screw caps at all? There are three reasons, and they are all valid. First of all, corks are labour intensive and expensive to produce. Cork is a natural material that needs to be harvested and processed. A cork oak can only be stripped of its cork after it reaches 25 years of age, and then only once every decade or so. Not only that, but as the cork oak has a life-span of up to 200 years, it can only be harvested around 17 times in total. Screw caps on the other hand can be mass produced at a much lower cost and they are recyclable. The result is more affordable wine for wine lovers that is also more respectful to the environment. Win-win! Secondly, let’s consider whether corks are appropriate for all wines. Corks are ideal at allowing just enough oxygen into the wine bottle as well as letting undesirable gases out. In other words cork is a natural material that allows wine to breathe and so age well. A screw cap on the other hand seals the bottle too tightly to allow wine to mature and age properly. So cork wins hands down, right? Well, not so fast. With very few exceptions, white and rosé wines should be drunk as young as possible – within two years of their vintage. They are simply not meant to be aged. With reds it is a little less clear cut – in theory. But again, most New World style, fruity and easy-going reds are not high enough in tannins to age for too much longer than white and rosé wine. Besides, what are the chances you will be selecting an age worthy bottle in your supermarket on your way home from work this Friday? And do you live in the kind of home that comes with a wine cellar in the dungeon? The final, and arguably most important reason why you should not dismiss screw caps out of hand, is this. Did you know that approximately 5-10% of wine on the shelves of any wine merchant is “corked”? Although cork is rot resistant, hygiene standards require that all corks be sanitised with chlorine. This causes a substance to form on the cork called trichloroanisole. Wine can react to it and develop a musty, unpleasant smell. This can happen to wine whether it is expensive or inexpensive and you will only find out about it after you have uncorked the bottle. If you are purchasing a wine with limited aging potential, is it worth the risk? So, instead of enslaving entire forests of cork oaks for hundreds of years, why not opt for the convenience and affordability of a wine with a screw cap? When you choose one, it’s worth taking a chance on a new bottle and finding out whether you like it or not. For example, recently, I came across this bottle of Casillero del Diablo Carmenere. I absolutely love it. It is delightfully fruity, spicy like a Shiraz and smooth like Merlot. It is absolutely the best wine to watch old episodes of Arrested Development on Netflix. And if I had been prejudiced about screw caps I would have missed out on the experience of tasting it! Which reminds me, we have a video comparing two bottles of 10 Euro Prosecco to see which one best pairs with Calamari. I will leave a link in the Description below so you can find out which wine won. And if you want to know more about pairing food and wine, head over to our blog, WineScribble.com and check out The WineScribble Guide To Wine and Food Pairing. And now for my bonus bit of trivia: is it true that all the cork in the world comes from Portugal? Well, the answer is…no. Cork oak flourishes across the Mediterranean. As well as Portugal, many Mediterranean countries produce cork, including France, Italy, Spain, Morocco and Tunisia. However, Portugal produces almost half the world’s supply of commercial cork. Not to mention that it is home to the famous Whistler Tree, the oldest and largest cork tree in the world! I would love to hear any questions you have about wine. Leave them in the comments section below, share them on our social media platforms or send them via email. I can’t wait to read them! And check out our Wine FAQs YouTube Playlist for videos that address questions about wine that you have asked. So, Tasters, if you have enjoyed this video, hit the like button below. And let us know that you would like us to continue making these videos by sharing them with your friends. Make sure you subscribe to our YouTube Channel now. And remember, those who drink get drunk. Those who taste, feel good. I will see you on the next video.